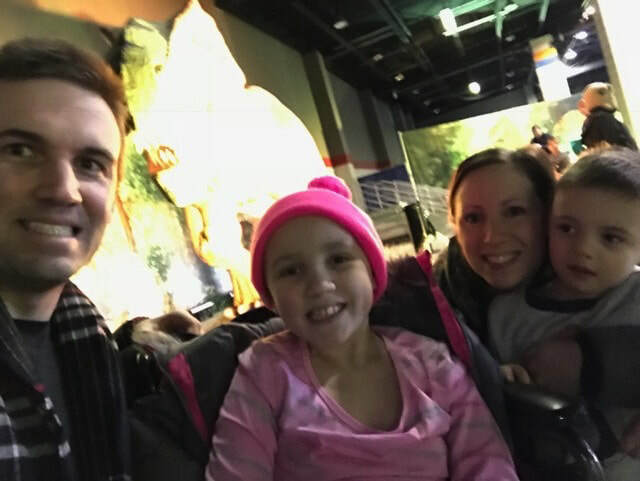 Briana’s chemotherapy treatments began in October and are all done inpatient at The University of Chicago Comer Children’s Hospital in Chicago. Each stay is 4-6 days and requires a parent to stay with her at all times. In January of 2018, she will have a major surgery to remove the tumor and reconstruct her leg. Following surgery, she will immediately resume chemotherapy and undergo intensive physical therapy to relearn how to use her affected leg. If her treatments do not become delayed, Briana will finish chemotherapy in May. At that time, she will have multiple scans done to determine if all the cancer was removed. "Hello, my name is Jaclyn Willhoit-Naling and I am the Aunt and Godmother of 7-year-old Briana Loeding. Just this past October, my niece was given the devastating diagnosis of Osteosarcoma. As I write this, I still find myself struggling to comprehend that this is now our reality. My niece is no different than any other 2nd grader. She loves to play video games, play with her cousins and excels in school. School is exactly where I wish she was right now, but instead she is currently admitted into Comer Children’s Hospital in Chicago receiving more rounds of chemotherapy to hopefully eradicate this cancer. In January she will undergo an invasive surgery to remove the cancer in her knee and will then follow with several more months of chemotherapy. We are all hoping and praying that when her treatment is through her scans will show that the cancer is gone and she can slowly return back to her life. Back to school, back to playing with friends, back to just being a little girl. The toll that this disease is taking on our family is great. As much as I worry about Briana, I also worry about her parents Brian and Lauren and the mental/emotional/physical/financial toll that this situation has placed on them. As a parent, their only concern needs to be Briana’s wellbeing. Worrying about how to pay for medical bills and everyday living expenses combined with Briana’s aggressive treatment- it’s just too much. Too much for anyone to have to endure. It is my hope, along with so many other people out there, that one day Cancer will be a thing of the past. A cure will be found and treatments will be less taxing on the patient so that no one will have to endure what my niece and her family are having to endure. But in the meantime, we need to work with what we have been dealt. I ask that you please consider my niece, Briana, for assistance from the BTB Foundation. Anything that can help ease and lighten the burden for her and her family is nothing short of miraculous. I truly appreciate your consideration and God bless."